You are a manufacturer of a product with high brand value. It could be FMCG or branded consumer durables, or patent protected industrial product. Through this agreement, you sell at home or abroad, to distributors or major retailers. Special terms are required to protect your very valuable brand and IP rights. These provisions affect many aspects of the deal. We have provided a specific licence to cover exactly what your distributor may or may not do. Apart from the brand and trade mark protection, this is a comprehensive distribution agreement dealing thoroughly with all the issues you would expect it to cover. We have worded the agreement in ways that seem simple and reasonable, but most provisions are there to safeguard your position and not your customer’s. We have covered product recall, minimum sales requirement, how you want the whole subject of marketing to be approached and how he will report to you. We have provided a “joined up” procedure taking in order > acceptance > delivery > risk > title > payment > returns, and so on. 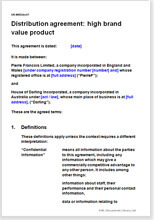 The contents of this document could be edited in the course of negotiation, but its best purpose is to use as a standard terms document, to which any merchant must sign if he wishes to use your services. There are over 200 provisions in the document supported by over 3000 words of notes, including those supplied in a separate document. Plain English, our business understanding and thorough care, make this the perfect document for your business.